Tiferet Miami uses practical Jewish mysticism to elevate our soul and bring the Divine into the world. We study Kabbalistic works, practice Jewish meditation and Yoga to bring mindfulness in all aspects of life: from the mundane to the sacred. We strive to enhance our prayer experience -to pray with Kavanah- and see the Divine in every human being. ​We recognize that peace in our life, in our community, and the world begins with Inner Peace. Rabbi Marc Philippe studied at Yeshiva Yad Mordechai in Paris, and has a Masters in Music from The Ecole Normale de Musique de Paris. In Europe, he was a conductor and Chamber Music musician as well as a Cantor. He received his Rabbinic ordination from Yeshiva Toras Israel in Jerusalem and has studied Jewish mysticism with Kabbalists in the Old City of Jerusalem. 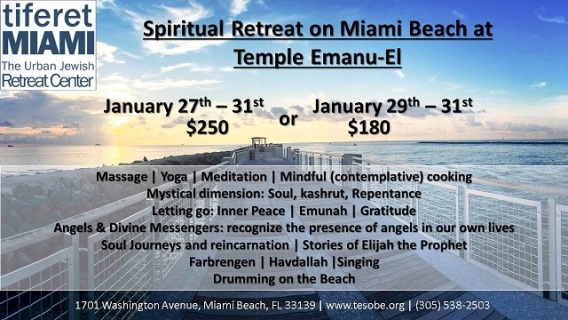 In Miami Beach, he is the Rabbi at Temple Emanu-El, where, among other things, he teaches Kabbalistic Spirituality and Jewish meditation. Rabbinic Intern, Arielle Shimko, is a certified Yoga teacher and successfully applies Jewish Spirituality to Yoga practice. She leads Jewish meditation and Prayer Groups and she is studying for Rabbinic ordination with Aleph, the Jewish Renewal Seminary. Join us for an uplifting, spiritual, mystical, urban retreat at Temple Emanu-El on South Beach, FL.